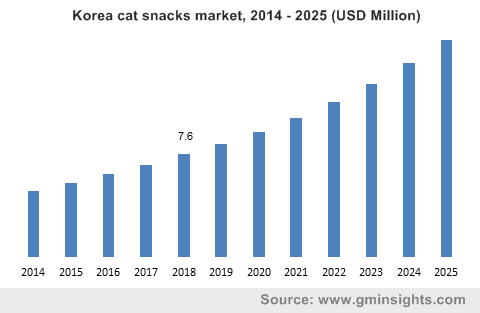 Cat Food And Snacks Market size was valued at over USD 31 billion in 2018 and will witness gains over 5.8% CAGR by 2025. Humanization of pets is the key driving factor for cat food and snacks market during the forecast period. Pet owners are providing their pet with food which reflects their own taste. Pet owners are providing their pets with specialist products, including those focusing on a specific health benefits which is expected to be continuing to be very popular and have shown strong growth. This trend is expected to be continue which will significantly boost the market during the forecast period. Cat food and snacks market is further driven by increasing trend of pet population and increased awareness about the health of the pet animals such as cat and dogs especially in developed nations including the U.S., Europe and South Korea. Cat food include all dry and wet commercial packaged food products produced for the consumption of pet cats while cat snacks include cat treats & mixers which are available in can, pouch, beef jerky, chicken breast, chicken ribs, sausage, etc. The increased consumer spending on pet food by pet owners is resulting in providing premium, luxury, healthy and functional foods to their pet’s diet which is expected to be continue and anticipated to boost the global market by 2025. Rising regulatory constraints in the pet food industry are expected to negatively affect the cat food and snacks market during the forecast period. For example, In the U.S., pet food is highly regulated and due to stringent laws imposed by the U.S. FDA to meet both the federal and state requirements. The regulatory body has imposed laws on both finished cat food products and their ingredients. An ingredient cannot be used in pet food until it has been accepted by FDA and by AAFCO (Association of American Feed Officials), these organization develops model bills and legislations for pet food. On the basis of type, the global cat food and snacks market has been segmented into food and treat & mixers. In 2018, cat food led the overall industry and accounted close to 90% of the overall demand in terms of volume. The food segment is further divided into two types such as dry food and wet food. In wet cat food, meat or fish are used as primary ingredients and it offers a meal suitable for cat's dietary needs. Thus, wet cat food is likely to exhibit above average industry gains of close to 6% CAGR over the forecast timeframe. Dry cat foods contains excessive carbohydrates in comparison with wet food as many dry foods possess grains such as cornmeal and rice, to process the kibble. Various cat foods contains vegetables based proteins over meat, which are not preferred by carnivorous cat. While cat treats and mixers are natural and grain free which are used as appetizer or topper and are used in cats with health issues such as overweight, gastrointestinal disorder, diabetes, allergies, etc. Among the different types of cat food and snacks the wet cat food market is expected to grow steadily during the forecast period owing to preference by the wet food by the cat. This is due to the fact that, cats cannot eat more diet having carbohydrate ingredients because they cannot produce the enzymes required to digest high amounts of carbohydrates. Pet owner are becoming aware of that fact and providing their cats with wet cat food which is expected to be continue and anticipated to boost the wet cat food market during the forecast period. 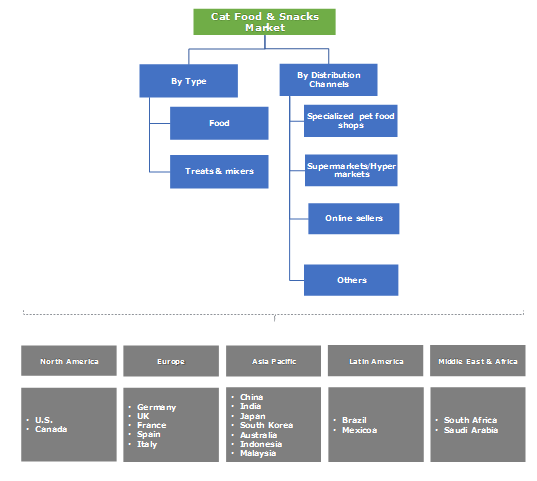 On the basis of distribution channels, the global cat food and snacks market is categorized into specialized pet food shops, supermarkets/hypermarkets, online sellers and others. The others segment of distribution channels mainly includes convenience stores, pharmacies etc. Supermarkets/hypermarkets based distribution channel for cat food and snacks industry accounted for the highest share in 2018 and generated revenue over USD 12 billion in the same year. The supermarkets/ hypermarkets distribute cat snacks and food with variety of other products and is thus widely accepted distribution channel across the globe, as it provide a widespread option to pet owner to compare various pet food brands along with procuring their regular monthly grocery. Various giants such as Walmart, Kroger, Tesco, Carrefour, etc. with numerous outlets/stores play a crucial role in such distribution channel. Specialized pet food shops provide the special food products for the particular pet animals such as cat or dog. Online sellers of the cat food and snacks provide variety of snacks and food products for cat through online channels. Online distribution channel has become prominent and feasible for regular pet food buyers due to high awareness of various types and brand available in the market. 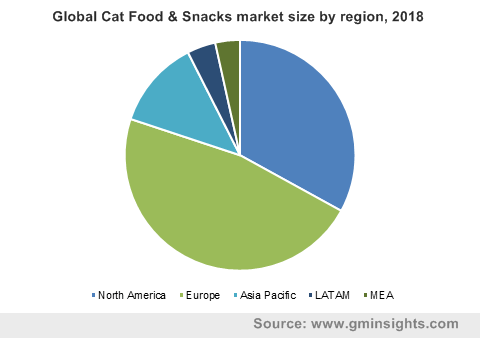 Based on region, Europe cat food and snacks market size was more than USD 14 billion in 2018. Regional growth is majorly driven by robust product demand for different types of cats. The U.K. is one of the major pet food share contributors. Thus, the region holds significant product demand. Furthermore, increasing trend of carrying pet animals with increased humanization is expected to boost the regional industry size by 2025. Asia Pacific is a prime contributor and is forecast to exhibit maximum gains close to 6% CAGR over the forecast period. The region will witness significant growth opportunities particularly due to increasing product demand with increasing population of pet animals owing to increased consumer spending in the region. The global Cat Food And Snacks market share was highly consolidated with top 5 players accounting for over 60% of the global cat food sales across the globe. Some of the prominent players operating in the industry includes Mars Inc., Nestle, Colgate-Palmolive, The J.M. Smucker Company, Schell & Kampeter, Inc., General Mills, Inc, Spectrum Brands., etc. Industry players are engaged in R&D to expand their product portfolio based on the customers demand. Also, abundancy of raw materials used in pet food manufacturing encourages new players in the business. Strategic partnerships, new product development, and enhancing the product landscape has been key initiatives in the global cat food and snacks market competitive landscape. Cat food and snacks are produced from various raw materials which is mainly include different grains and animal and fish meat. Current trends in the cat food and snacks industry are towards the production of products with high nutrient value. Gradually the industry is moving towards the production of pet animal food products with taste like human food and also with a good nutrient value. Players in the market are also focusing on the production of animal specific products such as cats, dogs, etc. Increasing consumer awareness about the health of pet animals and their preference for particular type of food is one amongst the major factor propelling the global market size. For instance, cat food and snacks market for wet cat food is expected to grow at a steady rate owing to more preference by cat to wet food than the dry food. Moreover, increasing consumer spending power has positively influenced the global industry share in the recent years.